Hot-rodding is a popular American culture. The phenomenon was first covered by magazines. Glossy print names such as The Rodders Journal, Hot Rod Magazine, Street Rodder, Popular Hot Rodding, and Rod and Custom Magazine are just a few of the magazines that feature this staple activity in the American life. In addition to print, hot-rodding likewise gained mileage in the visual wing of the media. Discovery Channel featured a lot of hot-rod documentaries such as Monster Garage, American Hot Rod, and Overhaulin’. And television shows such as My Classic Car and Horsepower TV also had dedicated episodes on topics about hot-rodding. Hot-rodding mostly began in the 1930’s in Southern California where people started modifying light cars with big engines and started racing them on the vast and empty lake beds northeast of Los Angeles. The original hot rods were old cars that were reduced to weigh less and improve aerodynamics. After World War II, many small airports were abandoned in the country. In effect, these venues allowed hot rodders to race on marked courses. World War II also helped the hobby’s popularity especially in California where a lot of returning soldiers had been given technical training in the service to modify such cars. At the heart of it all, the 1932 Ford Roadster was the car that every hot-rodder wanted. It was the car that changed the automobile industry forever. It was simple, lean and it had a coveted handsome body. 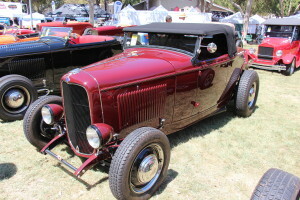 It also had a very affordable engine, the V8, which rewarded the 1932 Ford Roadster with the reputation as the perfect car for a nation that was obsessed with speed. But then just like like everything else, hot-rodding’s popularity started to wane. Car shows and drag racing divided the hot-rodding community. Then Detroit released muscle cars like the Plymouth Roadrunner and the Pontiac GTO. With these muscle cars, there was longer any need to put a Cadillac engine in a Ford Roadster. The Pontiac GTO could outperform any hot rod and it offered more passenger space. There was no longer any need to spend time to build and tune the car by oneself. The muscle cars had it all. But today, the hot rod culture lives on. And in January 2007, hod rod culture even celebrated its 75th anniversary by releasing The 75 Most Influential “1932 Ford Hot Rods”. The list was commissioned by Ford where a panel of hot rod experts reviewed some four hundred seventy-four worthy cars and whittle it down to seventy-five cars. So if you are interested to be part of the hot rod culture, I advise you to first try renting the car in one of car rental dealers in town. By renting it you would have a sample of experiencing the car, not just in some nostalgic showroom, but on the gravel itself. If you don’t like it, you won’t have any regrets because you can return it after renting. But if you like it (which I’m pretty much sure you will), then well and good. You might also want to check out these car rental dealers’ sites. Their websites already offer car models, prices, rental polices, special offers and reservations. Live out and be a part of the American Way in a rental such as the 1932 Ford Roadster. This is the American Way as you know it, discover it first hand on your exotic car rental. Las Vegas Exotic Car Rentals: From 1928 to 2008 we have the LARGEST selection of Exotic, Classic and Luxury Rental Cars on the Strip! From Auburns to Packards, Voyager Classics Car Rentals [http://www.voyagerclassics.com/fleet.php] has the largest selection of classics available for rent anywhere in Las Vegas.